Staying overnight at the beautiful 203-room Sheraton Cerritos in Cerritos, California. Just 5-10 minutes away from Cerritos College (Gym Facilities). The camp gives campers an opportunity to play against top players from all over the country, not just their individual states or regions like in high school basketball. ​More Than Just an "All-Star Game"
The Pangos All-American Camp is unique it offers an entire weekend of events beneficial to the student athlete. The camp is open to the public. Family, friends, coaches and fans are all welcome to attend. This year's camp is shaping up as one of the deepest and biggest size-wise in recent years. Past camp MOPs have been James Harden (Arizona State/Houston Rockets/2009 NBA Draft #3 pick), Brandon Jennings (Detroit Pistons/2009 NBA Draft #10 pick), John Wall (2008 Rivals.com #1 player/Kentucky/Washington Wizards/#1 pick of the 2010 NBA Draft), Harrison Barnes (Scout.com & ESPN.com's #1 2010 player/North Carolina/Golden State Warriors lottery pick), Shabazz Muhammad (consensus #1 in 2012/UCLA/Minnesota Timberwolves), Stanley Johnson (NBN #1 player/projected Top 5 pick in 2015 NBA Draft) and Cliff Alexander (Top 5 2014 prospect/Kansas). The nation's #1 2011 prospect Anthony Davis(Kentucky/New Orleans Pelicans), Quincy Miller (Baylor/Denver Nuggets), Brad Beal (Florida/Washington Wizards), DeAndre Daniels (UConn/2014 National Champs/Toronto Raptors draft pick), Chasson Randle (Stanford), LeBryan Nash (Oklahoma State) and Quinn Cook (Duke) were Top 25 Game selections in 2010. 2011 Top 25 Game standouts included Andre Drummond (UConn/Detroit Pistons), Anthony Bennett (UNLV/#1 pick of the 2013 NBA Draft/Cleveland Cavaliers), Isaiah Austin (Baylor), Grant Jerrett (Arizona/OKC Thunder), Cameron Ridley (Texas), Marcus Paige (North Carolina), Tyler Lewis (NC State/Butler), Archie Goodwin(Kentucky/Phoenix Suns), Jordan Adams (UCLA/Memphis Grizllies), Aaron Gordon (Arizona/Orlando Magic) and Kris Dunn (Providence). As has been the case in past years, a large contingent of national/regional media and scouts are expected to attend. 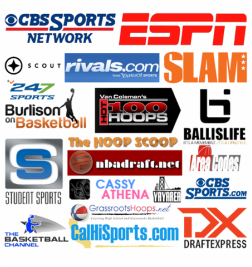 National media/scouts attending past camps include Van Coleman & Jerome Williams (The Basketball Channel), Clark Francis (Hoop Scoop), Frank Burlison (BurlisonOnBasketball.com), Brick Oettinger (PrepStars.com), Jerry Meyer (247Sports.com), Eric Bossi (Rivals.com), Dave Telep, Paul Biancardi, Jeff Borzello & Joel Francisco (ESPN.com), Evan Daniels, Rob Harrington & Josh Gershon (Scout.com), Seth Davis &Doug Gottlieb (CBS Sports), Scott Phillips (NBC Sports), Aggrey Sam (SLAM Magazine), Ronnie Flores (GrassrootsHoops.net), Horace Neysmith (All-Metro Sports), Patrick Stanwood & Sean Ceglinsky (Nothing But Net Magazine), Chris Lawlor (Blue Star Media), Thom Jones (TJ Sports), Aran Smith (NBADraft.net), Jonathan Givony (DraftExpress.com), Christian Popoola(PremierBall.com), Chad Groth (AreaCodesBasketball.com), Joe Davis (Scouts Focus) and Matt Rodriguez (BallisLife.com). Besides the players mentioned above, other past camp standouts include NBA draft picks like Russell Westbrook (Oklahoma City Thunder), DeMar DeRozan (Toronto Raptors), Derrick Favors (Utah Jazz),DeAndre Jordan (Los Angeles Clippers), Kyle Lowry (Toronto Raptors), Chandler Parsons (Dallas Mavericks), Jrue Holiday (New Orleans Pelicans), Derrick Williams (Sacramento Kings), Jordan Hill (Los Angeles Lakers), CJ Miles(Cleveland Cavaliers/2004 Camp MVP), Arron Afflalo (Denver Nuggets), Jared Dudley (Milwaukee Bucks), JJ Hickson (Portland Trailblazers), Jerryd Bayless (Milwaukee Bucks), Taj Gibson (Chicago Bulls), Zack LaVine (Minnesota Timberwolves), Robert Swift (Oklahoma City Thunder), Dorrell Wright (Portland Trailblazers), Anthony Randolph (Golden State Warriors), Kyle Weaver (Oklahoma City Thunder), Austin Daye (San Antonio Spurs), Jeff Pendergraph (San Antonio Spurs), Gabriel Pruitt (Boston Celtics), Gani Lawal (Phoenix Suns), Darius Morris (Brooklyn Nets), Jeremy Tyler (Golden State Warriors), Howard Thompkins (Los Angeles Clippers), Chris Singleton (Washington Wizards) and Quincy Pondexter (Memphis Grizzlies) as well as current college stars that fill rosters at such elite schools as Kentucky, UConn, Duke, North Carolina, Florida, UCLA, Memphis, Texas, Kansas, Arizona, USC, Stanford, Michigan State, Washington State, Louisville, Georgetown, North Carolina State, Arizona State, Washington, Cal, Georgia Tech, Baylor, Oklahoma State, Villanova, Texas A&M, Marquette, Oregon State, Florida State, Michigan, Tennessee, Gonzaga, Oregon, Georgia, Miami FL, Alabama, UNLV and Louisiana State.